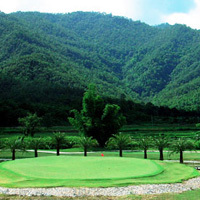 Experience the charm of Northern Thailand at Chiang Mais newest championship golf course. Only 15 minutes south of Chiang Mai is Gassans newest masterpiece, the extraordinary Lake City. This 18-hole, 6,400 yard, par-72 beauty from 2005, designed by Gassans owner, noted Thai architect Pravit Reang-Po, mirrors the unique clubhouse and the sculpted bunkers of Gassans Khuntan Resort. Also a target golf and risk-reward layout, Lake City has expansive water hazards on every hole. Many of the par-4s can be driven yet danger lurks. The short approach shots to the greens demand precision and proper placement so Lake City rewards thoughtful play over pure power. A third golf course Gassans Marina is already under construction and scheduled to be open in late 2006.